What is multiple sclerosis stem cell therapy? Multiple Sclerosis is a chloric and unpredictable neurological disorder of the central nervous system which consists of the spinal cord, optical nerves, and brain. 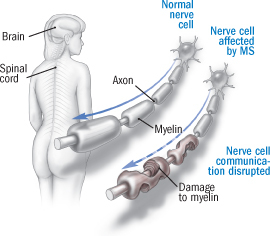 The disorder causes dysfunctions of the neurons as a result of myelin destruction (a substance that surrounds body’s nerve cells). Myelin is a fatty material that plays a vital role in the nervous system because it enables information transmission between neurons. MS causes dysfunction of the musculoskeletal, sensorial and cognitive system and sometimes the condition can have negative effects on activities of internal organs such the kidneys and gastrointestinal tract. The causes of Multiple Sclerosis are still unknown; however, it is considered an autoimmune disease where the body’s immune system attacks its own tissues. The effects of this condition vary from one patient to another. Some patients may have mild signs and symptoms and may not require treatment while others will have challenges getting around and performing daily activities. The initial symptoms begin between the age of 20 and 40 where most people have relapses when the condition gets worse followed by recovery times when the symptoms improve. For other patients, the condition gets worse over time. Currently, Multiple Sclerosis medication only helps manage the symptoms by suppressing, slowing down or altering the body’s immune system activity. These drugs don’t repair the damaged myelin but instead exposes one to fatal and life-threatening side effects. Multiple sclerosis stem cell therapy works more effectively on the disease. Here´s how. Multiple Sclerosis stem cell therapy has shown therapeutic benefits by repairing and regenerating damaged tissues, reducing inflammation and regulating the immune system. Adult mesenchymal stem cells also referred to adipose-derived stem cells are found in different parts of the body such as adipose tissue (fat tissue). Adipose tissue has various cell types and one of them is the stromal-vascular fraction (SVF) which has a lot of adipose-derived stem cells as well as high concentrations of other crucial components like T-regulatory cells, endothelial precursor cells with strong immune-modulatory and anti-inflammatory features. Additionally, they easily integrate with different body specialized cells. They also create extra cells that assist other stem cells perform effectively as well as have the capacity to selective enhance injured tissues and repair them. What is HSCT treatment for multiple sclerosis? The StemCells21 scientific and medical team study the latest Multiple Sclerosis stem cell therapy that uses collected stem cells to reverse the MS patient’s immune system as well as some MS-associated complications like type 1 diabetes. This therapy is called autologous hematopoietic stem cell transplant (AHSCT or HSCT). Autologous hematopoietic stem cell transplant is just like chemotherapy which treats cancer; chemotherapy removes the immune system and then the immune system and blood are brought back using the patient’s own stem cells. This one-off procedure is thought that the immune system ”start up again” is safe, more tolerant and less likely to attack body tissues. In this case, the stem cells are not considered as a nervous system repair contributor but are primarily used to re-establish immune system and blood following the chemotherapy. Supportive medical treatment is offered immediately in cases where patients are at an increased risk of bleeding or contracting infection as a result of extreme immune suppression. Would you like Treatment for Multiple Sclerosis?